How does EFTsure help my Organisation? How it does help my Organisation? 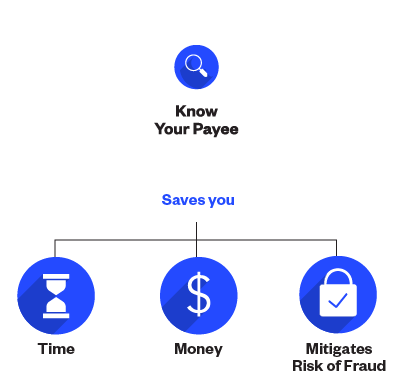 ‘Know Your Payee™’ identiﬁes payments being made to the wrong company or person, either through error or fraud. It maintains the integrity of your Vendor Master File on an ongoing basis and allows you to on-board new payees with more accuracy and certainty, tracking details if they change. Providing you with peace of mind that your system and database is now independently veriﬁed by a third party with technology and expertise beyond that of your accounts department. Ensures you’ve taken all precautions to protect the organisation’s money & reputation. The digital world has changed the business landscape. We are solving problems that were previously unsolvable. There is now no need to be ok with the risk and error your organisation previously lived with. Let us show you. Why did I receive an email from my customer? This is because EFTsure has been authorised to perform supplier verification on behalf of your Customer. This process reaches out to all of your Customer’s suppliers, is a procedural request and is not related to a specific invoice or payment. Should you wish to further validate legitimacy of this request, you may contact the accounts department of your customer directly. The process only takes a couple of minutes, is very simple to complete and helps ensure that payments intended for you arrive in your account. Please contact support@eftsure.com.au for further information or if you have any queries or concerns.